Home / Books, kits, magazines and patterns / Designs by Lee / Butterfly Kimono shrug pattern - Pattern available in English and French. This is my first official design with a rare butterfly stitch on the arms with some pointelle down the front and back. 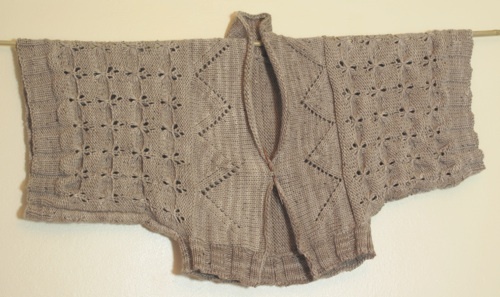 It is knitted in the wonderful Araucania Azapa which is a blend on wool and alpaca with some Donegal tweed. As the yarn is so wonderfully soft we should have called it a hug rather than a shrug. This is a roomy item and will fit sizes 10 - 16. I hope you enjoy knitting and wearing it as much as I have.